Foluke Akinradewo – Two-time PAC-10 Player of the Year (2007 and 2008) Akinradewo was born in Canada, but grew up in Florida where she became a standout in volleyball, basketball and track. She was a member of the Stanford volleyball team, an alternate on the 2008 U.S. Women’s Olympic Volleyball team and a member of the silver medal-winning 2012 U.S. Women’s Olympic team in which she was the second best blocker. Akinradewo is currently a member of the Volero Zurich club. Rachael Adams – An unstoppable force in the middle, Adams dominated play for the University of Texas at Austin from 2008-2011. She was a member of the FIVB World Championship (Gold) team in 2014 as well as the Pan American Games (Gold) in 2015. 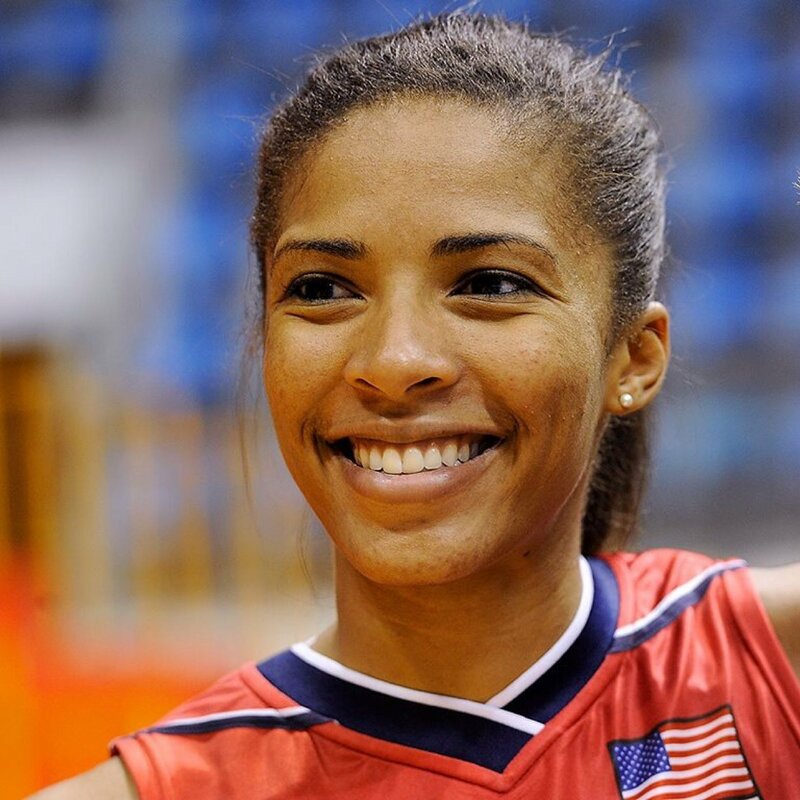 Adams has garnered respect from her teammates both as part of the U.S. Woman’s National Team and she as a member of Unione Sportiva ProVictoria Pallavolo Monza. Chiaka Ogbogu – Currently University of Texas’ all-time block leader, Ogbogu helped lead the university to its 2015 NCAA Division I tournament championship match. Three years later, she became a part of the U.S. Woman’s National Team which won gold at the Pan-American Cup. During her college career, Ogbogu was named AVCA All-American four times (including three, First-Team selections). Haleigh Washington – This middle hitter helped lead Penn State University to the 2014 NCAA Division I title as a freshman and three-time AVCA All-American First-Team player. Washington became a member of the U.S. Woman’s National Team and helped the team earn gold at the 2018 Pan American Cup. Her high school career includes an all-time record 48 kills in one match and Player of the Year honors in 2012. Aiyana Whitney – Another prominent Penn State University alum, Aiyana Whitney helped lead the women’s volleyball team to two NCAA Division I Championship titles in 2013 and 2014. Four years later, Whitney scored 91 points at the 2018 Pan American Cup which lead to a gold medal victory. As part of the U.S. Women’s National Team, played in the USA Volleyball Cup vs. Brazil and the FIVB World Grand Champions Cup earning bronze. Simone Lee – Lee also led Penn State University to the NCAA Division Tournament championship in 2014. Before her college career began, she was a member of both the 2012 and 2013 U.S. Girls’ Youth National Teams and in 2013 the team finish with a silver medal in the FIVB U18 World Championship. A Wisconsin native, Lee was selected as the 2013 Wisconsin State High School Gatorade Player of the Year. As part of the U.S. Woman’s National Team she helped the team earn gold at the 2018 Pan American Cup. Nicky Nieves – A member of the U.S. Woman’s Sitting Team, Nieves achieved the ultimate success earning gold at the 2016 Paralympic Games in Rio de Janeiro. The 2014 team garnered success with a silver medal in the ParaVolley World Championships. Nieves started playing volleyball in 2002 eventually earning Conference Player of the Year honors during her senior of high school. She played for Queens College in New York before joining the U.S. Woman’s Sitting Team.